Metallics were a big trend at the catwalks this year. We have got some brand new amazing metallic fabrics for you to create your own eye(and light) catching outfits. Gloria crinkle jersey would look simply stunning as a little dress – party outfit sorted! This is Ricki, a metallic, denim jersey and it is about as awesome as it sounds. A sparkly T shirt? Pair of leggings? let your imagination sparkle. My personnel favourite! This Studded ponte roma weight jersey, let out your inner Rock chick in this fabric. An Italian ex-designer linen in Olive green and Silver. 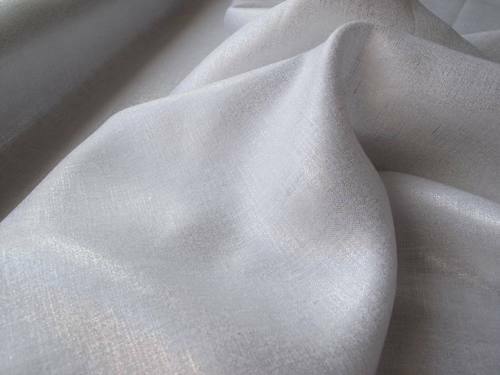 A most luxurious fabric with a metallic finish, I would use this for a long simple dress to keep cool when the weather gets warmer, but would look just as stunning as a fit and flare party dress.